Free radicals are molecules that occur in our body as a side effect from cellular reactions. Even though the production of free radicals is caused by normal bodily processes, it can certainly be exacerbated thanks to external factors, such as smoking, pollution or unhealthy diet. When free radicals run amok, they can increase the chances of developing various medical conditions, including cardiovascular and neurodegenerative diseases. When it comes to your skin, free radicals can also accelerate aging processes and cause your complexion to become dull, saggy and riddled with fine lines and wrinkles. Now, we all know that the old “eat your veggies” mantra is the key to achieving balanced health. But, why is this the case? Well, for one, plants are chock-full of components called antioxidants, which should be your number one weapon in the fight against harmful free radicals. You’ve probably heard of the most famous among these super-charging agents. For example, we all know that Vitamin C can do wonders for your immunity and that Vitamin E can help with your hair and nails. However, there are many more body-boosting antioxidants that probably aren’t on your radar, despite being just as great for your overall health. To help you find out all about these nutritional powerhouses, we’ve compiled a list of potent, yet lesser known antioxidants and all the foods where you can find them. One of the most important minerals for our organs in selenium. This must-have oglioelement can act as a powerful shield for your cells, protecting them from oxidizing damage. As a result, it can prevent premature aging of the skin, muscles and brain. Selenium is also effective in preventing heart diseases, thyroid dysfunction and even depression. More broadly, selenium can also improve your overall immunity and help your body become better at fighting off illness. It can also act as a purifying agent in your liver and rid your body of harmful toxins. If all of this sounds like something you could benefit from, you’re probably wondering where to find this all-powerful mineral. 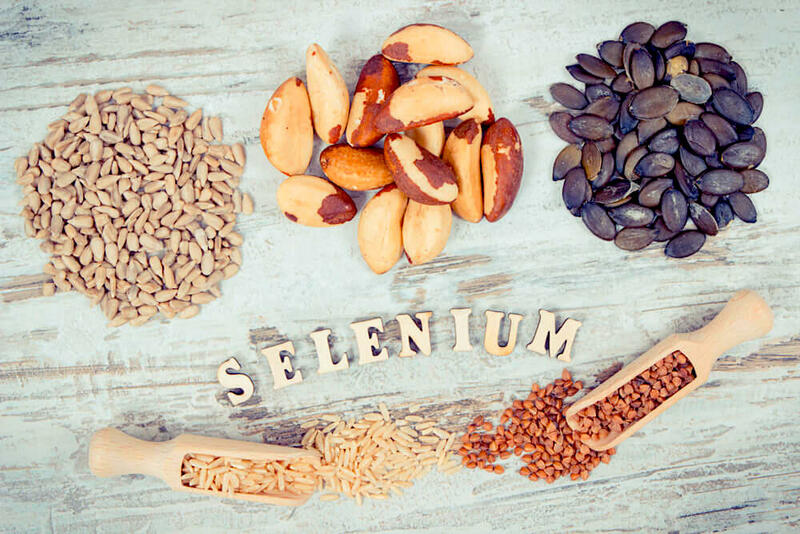 The best way to up your selenium intake is simply to consume more foods that are enriched with this antioxidant. One of the richest sources of selenium is Brazil nuts. These bite-sized nutrients can be eaten as a snack or added to your favorite oatmeal and even salad. Fatty fish is another food loaded with selenium. Among them, yellowfin tuna reigns supreme when it comes to concentration of selenium, but you won’t go wrong with halibut or sardines, either. Considering the number of foods that are packed with selenium, it’s easy to build a diet that’s rich in this particular type of mineral. When it comes to health and wellness, lycopene is a definite miracle-worker. This bright-red carotenoid pigment and phytochemical is present in many red fruits and veggies. Due to its immense antioxidant properties, lycopene can be effective in neutralizing free radicals that are causing damage to your health and your skin. The benefits of consuming lycopene on the regular are multifold. For one, it protects your cardiovascular system and enhances circulation in your muscles, kidneys and brain. As one of the most powerful antioxidants, it can help counteract damage caused by oxidative stress. Moreover, it can be an effective agent for relieving symptoms of asthma. The undisputed star among lycopene-enriched foods is none other than tomato. By regularly consuming this tasty treat, you can improve your eyesight, circulation and cardiovascular health. Tomatoes are incredibly versatile and can be used to make sauces, dips and other condiments. They can also be consumed fresh, drizzled with olive oil over wholegrain bread or chopped with other veggies for a lycopene-rich salad. Another compound that holds immense antioxidant powers are catechins. These type of flavonoid are credited with anti-inflammatory, anti-arthritic and immunity-stimulating properties. Presence of catechins in your diet can help reduce chances of developing cardiovascular diseases and even cancer. Due to their anti-inflammatory powers, catechins can also be a useful weapon in relieving signs of arthritis. 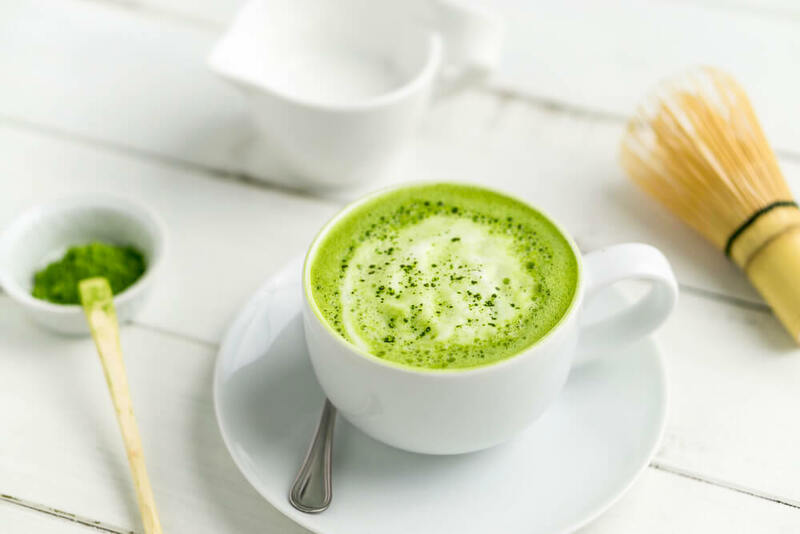 Since they are effective in preventing oxidation, catechins are valuable in protecting and restoring the condition of your vital organs, including heart, lungs, kidneys and stomach. Finally, catechins can aid in accelerating your metabolism, which makes them a welcome addition to any weight loss-oriented diet plan. So, where do you find these body-soothing oxidants? One of the most hailed sourced of catechins is green tea, whose medicinal powers have been known to humankind for centuries. Green tea is also an amazing detoxifying agent. You can consume it early in the morning to kick-start your body or later in the evening to purify your organs from the toxins you’ve accumulated throughout the day. Another valuable source of catechins is cacao powder. Frequent consumption of raw cacao powder (not to be mistaken with cocoa!) can replenish your body with these metabolism-boosting antioxidants. You can use cacao powder in smoothies, oatmeal and various desserts to give them a richer, more palate-pleasing aroma. Carotenoids are natural pigments that can be found in numerous plants. Not only do these compounds give our fruit and veggies their lovely vibrant hues, carotenoids can be also incredibly beneficial for your health. And one of the leading carotenoids is beta-carotene, a nature-derived pigment which can step up your wellness game in a number of ways. For example, a diet that is rich in beta-carotene can help reduce chances of developing cardiovascular diseases. When combined with Vitamin E, beta-carotene can regulate cholesterol levels and decrease the risk of arteriosclerosis. Moreover, beta-carotene is also credited with anti-cancerous properties; it can also slow down cognitive deterioration and boost your mental capabilities. When it comes to your skin, beta-carotene can be potent in reducing symptoms of premature aging, but also signs of environmental damage, such as UV rays, smoking and pollution. Finally, beta-carotene can be a powerful weapon for improving your eyesight. If you want to arm your fridge with beta carotene-rich foods, but are not sure which ingredients to reach for next time you’re in the supermarket, look for veggies that are green, yellow or orange. 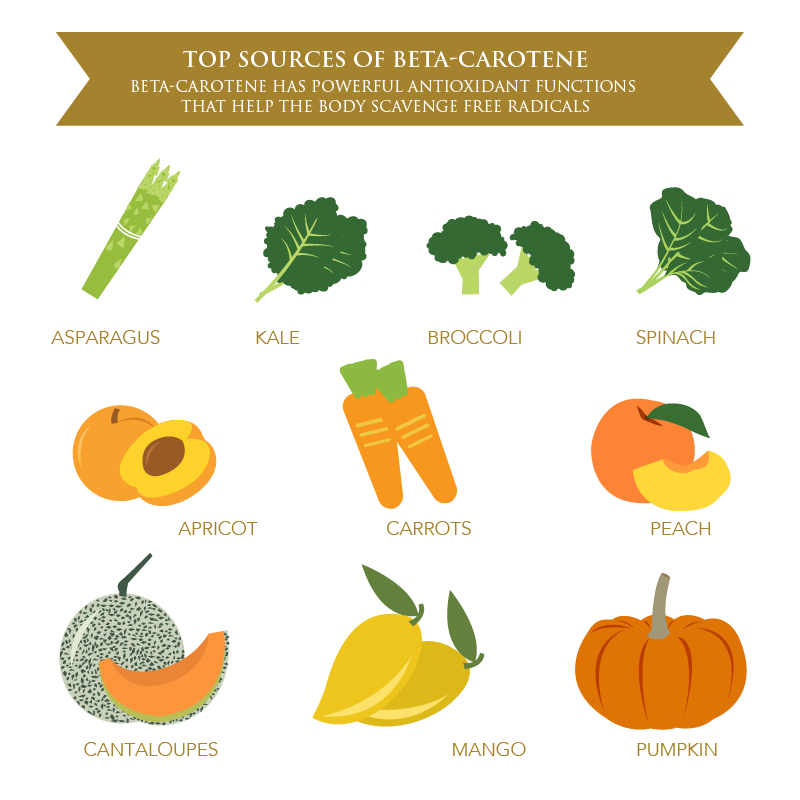 Veggies that have the highest concentration of beta-carotene include carrots, sweet potatoes, peppers and spinach. Curcumin is a powerful active ingredient found in the root plant we know as turmeric. Because of its potent medicinal powers, turmeric has been used in South Asia for centuries. This should come as no surprise: curcumin’s benefits for your health are too many to name. For example, due to its effective anti-inflammatory properties, curcumin can be used to treat all types of inflammation in the body. It can also serve as a strong shield against free radicals, but also boost the body’s own capacities of producing antioxidants. As a consequence, curcumin will help you slow down aging processes and mitigate damage caused by free radicals in your body. Upping your curcumin intake can also improve your cognitive abilities and reduce the chances of developing depression and Alzheimer’s disease. Fortunately, turmeric can be introduced into your cuisine in a number of delicious, creative ways. For a quick and easy option, infuse a glass of warm water with turmeric and a teaspoon of honey and you will get a rejuvenating antioxidant-packed beverage. Alternatively, you can also use turmeric in pastas and rice-based dishes. Not only will you give them a healthy kick, they will also turn an alluring orange color. Zinc is one of the most important minerals when it comes to reversing the aging processes. When your body is deprived of zinc, it becomes more vulnerable to the formation of free radicals and subsequent cell and tissue damage. Moreover, lower zinc levels can manifest themselves in changes in weight, chronic fatigue and various digestive issues. To counteract these effects, you have to make sure your daily meals are replenished with this good-for-you antioxidant. Consuming zinc will help improve your immunity and arm your body in the fight against common cold and other viruses. Zinc can also have a regulative role when it comes to hormones, which can be greatly beneficial for reproductive health in women. This straight-from-nature mineral can also balance blood sugar and prove to be a valuable agent for curing diabetes. The reparative properties of zinc can help restore and grow muscle tissue. And if you have troubles identifying which foods are loaded with zinc, it’s easy: just look for ingredients that are high in protein. When it comes to meat, zinc can mostly be found in organic, grass-fed beef, lamb, chicken and turkey, as well as certain kinds of dairy and seafood. Few compounds are as effective in reducing cardiovascular conditions as resveratrol. This bioflavonoid antioxidant can be incredibly powerful in delaying aging processes and protecting your body from environmental pollutants. However, the most famous ingredient that’s packed with this nutritional powerhouse is red wine. After all, it’s the French who get to eat all those fat and sugar-laden treats without developing as many heart issues, isn’t it? 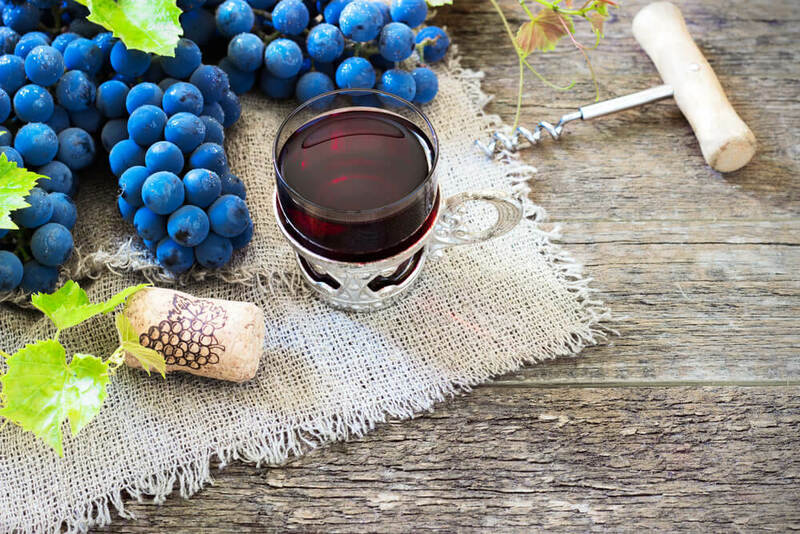 Consuming red wine in moderation can be a great way to replenish your organs with this super-healthy nutrient. By supplying your body with this powerful antioxidant, you can regulate your bad cholesterol levels and prevent the occurrence of blood clots. However, keep in mind drinking too much alcohol can have adverse effects on your health; you should avoid it completely in case you’re pregnant, take certain medications or have a history of alcoholism. You can still have your daily dose of resveratrol by munching on red grapes or drinking grape juice! A superhero for the eyesight, lutein is another powerful antioxidant that you can introduce into your everyday meals. When free radicals go wild, they can also have a damaging effect on your eyes. Combine this with prolonged exposure to sun’s harmful UV rays and it becomes clear why so many people suffer from impaired vision and degenerative eye conditions. The benefits of consuming high doses of lutein can certainly help in improving your vision and relieving eye-related ailments. So, what do you need to eat to get that crystal-clear vision? Well, the richest sources of lutein tend to be leafy greens. And if you want non-plant-based options, go for free range eggs, especially the yolk. A king among antioxidants, glutathione is often cited as one of the most important free radical-fighting nutrients that can be found in your body. It is located within the cell, and each one in your body produces this almighty peptide. Furthermore, glutathione is composed of three essential amino acids that are incredibly important for the way your body functions. Okay, looks like you’re convinced – now, where do you find this antioxidant powerhouse? One of the best ways you can naturally boost your glutathione intake is to consume whey protein. Just make sure to opt for the organic, hormone and pesticide-free version of it. Another rich source of glutathione is cruciferous vegetables, which contain high doses of sulfur and, as such, should find themselves on your plate at least once a day. By consuming these body-rejuvenating nutrients, you will improve your immune system, reduce chances of drug resistance and shield your body from various environmental pollutants that are damaging your organs. And with this, we round up our list of the most powerful antioxidants that can help you boost your immunity, reduce chances or illnesses and halt aging processes that occur in your body. Now that you know all about these nutrients and where to find them, nothing is stopping you from getting that much-needed health kick. Is Cold Weather Harmful for Your Skin? Do You Have Enlarged Pores? Can Stress Cause Eczema Flare-Ups?